Partitioning tables is a great tool to increase the manageability of your data. Being able to move large amounts of data in and out of a table quickly is incredibly helpful. However, partitioning comes with a whole bunch of caveats and we need to be aware of what’s going on. This especially applies when creating indexes on partitioned tables, as there are a couple of things we need to be aware of. N.B. – Keeping it simple, all partitions going to the PRIMARY filegroup. You wouldn’t do this when creating a normal partitioned table but I want to show you the index structure, so for the purposes of this demo, the location of the partitions doesn’t matter. Great, now we can look at creating indexes on the table. First let’s look at creating clustered indexes on this table. Now, when creating a UNIQUE CLUSTERED INDEX on a partitioned table, the partitioning key must be explicitly defined in the index definition. Column ‘CreatedDate’ is partitioning column of the index ‘IX_ID_PartitionedTable’. Partition columns for a unique index must be a subset of the index key. This is generated as we did not specify the CreatedDate column in our index. SQL needs the partitioning key to be explicitly defined in all unique indexes on partitioned tables. This is so that SQL can determine the uniqueness of that index by checking one partition. OK, so what about nonclustered indexes? Well it’s the same story when it comes to unique nonclustered indexes. The partitioning key must be explicitly defined in the index. But what about non-unique nonclustered indexes? Let’s have a look. N.B. – this is an aligned nonlclustered index. Meaning that is using the same partition scheme and key as the base table, you can read more about aligned and nonaligned nonclustered indexes here. This time I have got my results back in a grid. But look! CreatedDate is there! 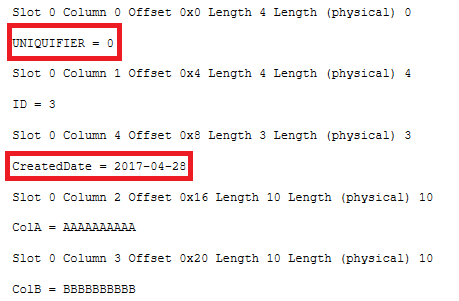 SQL has implicitly added the partitioning key to my index as an included column. OK, but why does this matter? Well, this can catch you out in certain situations. Let’s run a quick test on trying to SWITCH a partition from the table we’ve built. Now, this table is not partitioned. Standard really, non-partitioned table as an archive for old data in the table. for the index ‘IX_ColA_PartitionedTable_Switch’ in target table ‘PartitioningDemo.dbo.PartitionedTable_Switch’ . This has happened because even though the t-sql statements for both indexes are the same, the partitioned table’s index has the partitioning key as an included column and the switch table does not. And now the switch will work! The best way to prevent this from happening is to create a unique clustered index on your partitioning key (with something like an identity integer column if the key isn’t unique by itself). That way the partitioning key will automatically be in all of your nonclustered indexes.